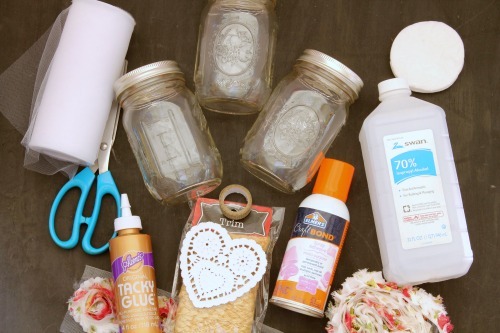 These quick and easy Mason jar crafts are perfect for your shabby chic home decor or a fun party theme. 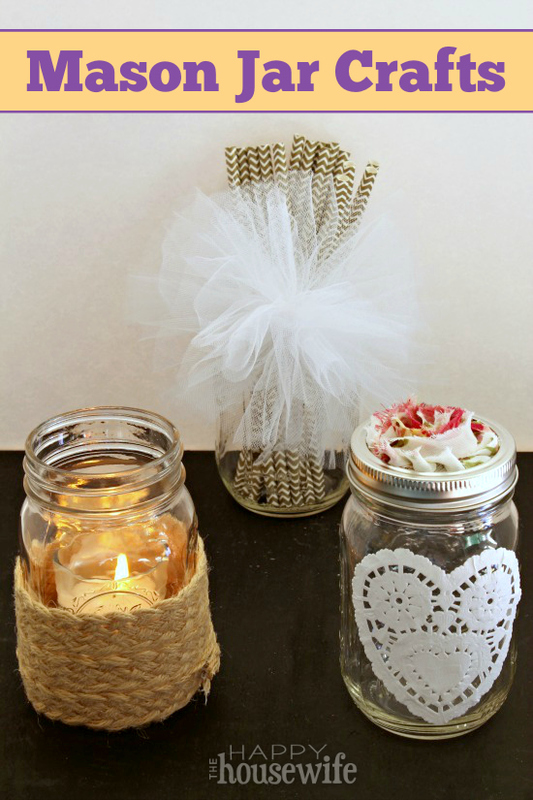 Using the cotton balls, thoroughly clean all of the Mason jars with alcohol. This will allow the glue to adhere better. 1. 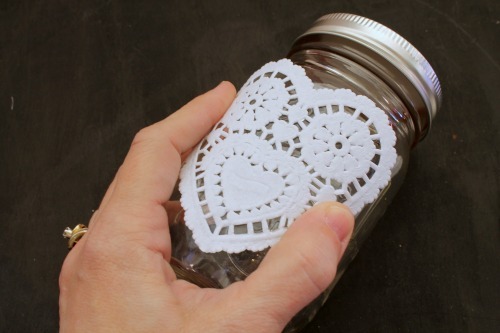 Start by testing a good location for the doily before you apply the glue. 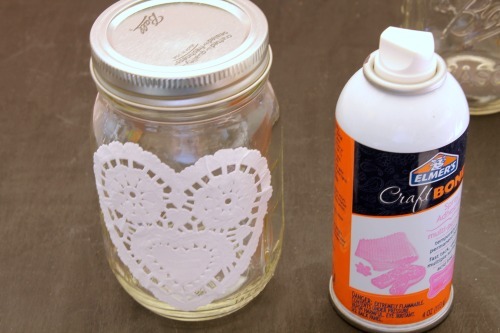 Spray the Elmer’s Craft Bond spray adhesive onto the doily and place it in your pre-determined location on the jar. Don’t spray the adhesive onto the glass since this will leave a film. 2. 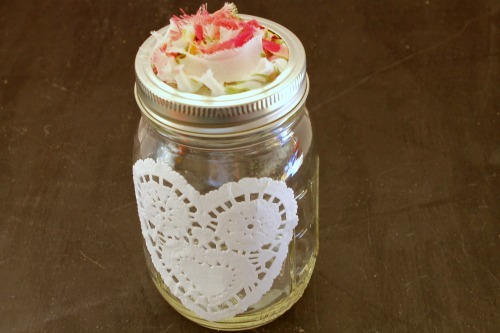 Cut out a piece of your flower ribbon trim that will fit onto the mason jar lid. 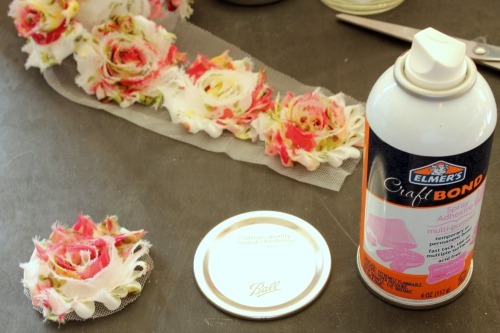 Spray the mason jar lid with the adhesive and place the flower onto the lid. Make sure to position it in the center quickly since this glue is fast to dry. 3. 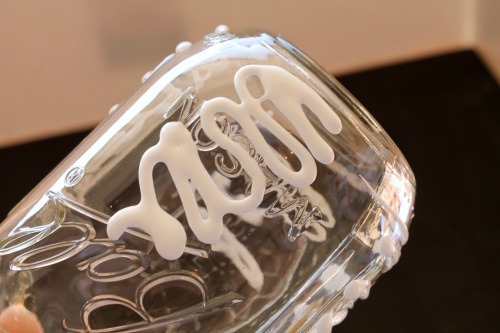 Let the glue on the lid dry thoroughly before replacing the lid on the jar. 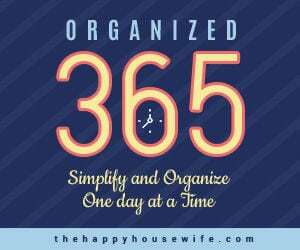 You don’t want your jar to be stuck shut! 1. 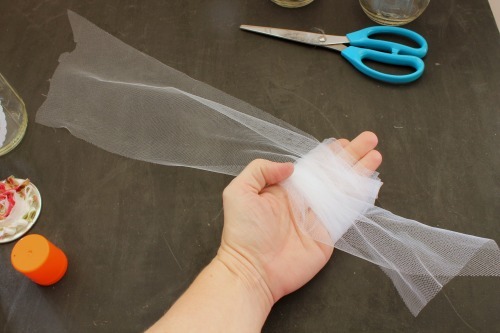 Start by wrapping the tulle around your hand about 15 times. 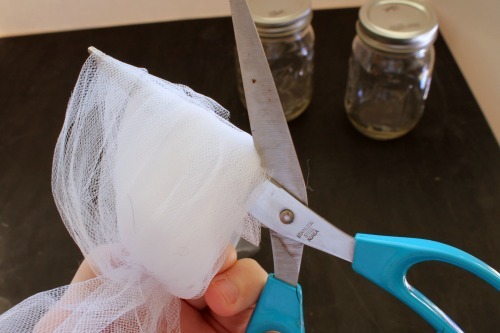 Make sure to leave at least 6 inches of tulle on both sides of your hand. Cut the tulle and then cut another piece of tulle about 4 inches long. 2. 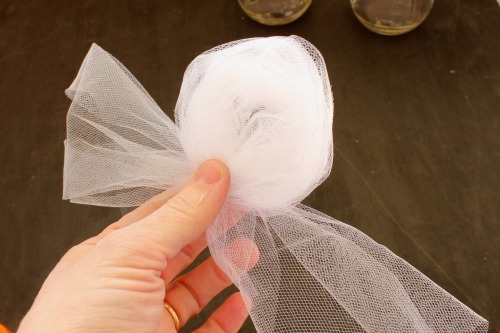 Remove the tulle from your hand and hold the circle in place. 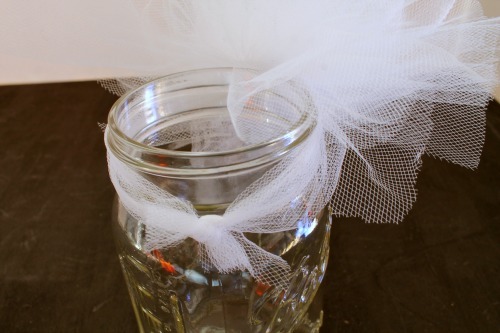 Tie the 4-inch piece of tulle around the circle. Knot that tie very tightly to hold the material in place securely. 3. 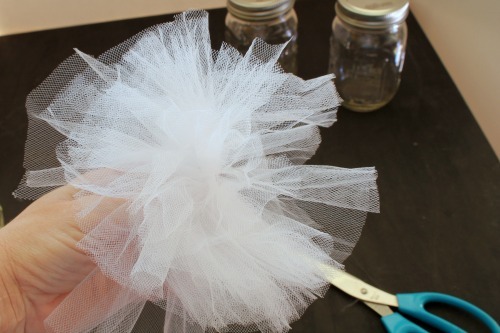 Gather the tulle opposite the knot and cut through all the layers. 4. Fluff the pom pom. 5. 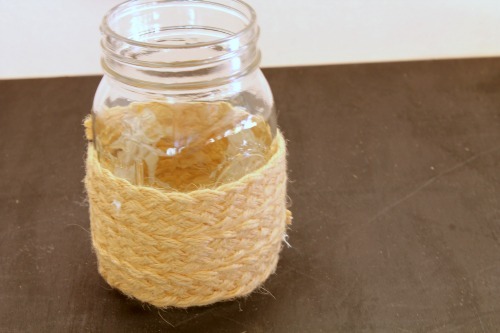 Secure the longer 6 inch strands at the back of the mason jar by tying in a knot. 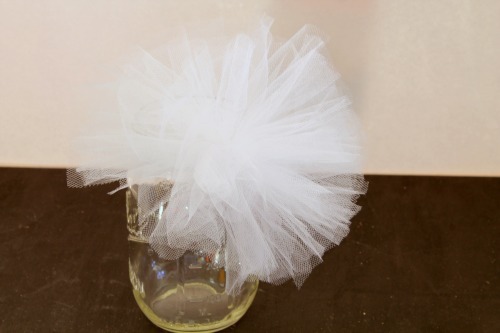 Trim any excess tulle. Leave the lid off to use as a cute storage container. 1. 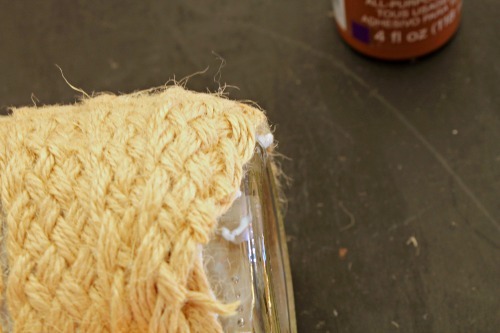 Apply the Aleene’s glue about 4 inches up each side of the jar. 2. 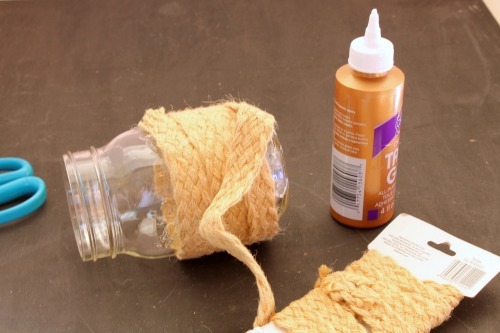 Starting at the top of the glue, wrap your rope around, pulling tightly to lay flat. The glue doesn’t dry very fast so you have time to scoot things around to make it all perfect. Take your time and make it right. When the glue is dry, it will be clear so don’t need to worry about any glue to that is visible while you work. 3. Trim the bottom portion of the rope to taper and fit along the bottom. I apply extra glue to that piece to make sure it stays adhered. 4. 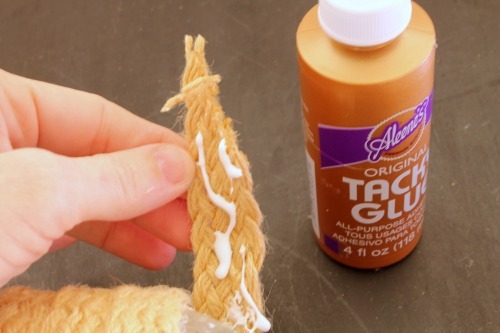 Use extra glue all along the rope to secure any stray pieces. 5. Take a final look along the rope to make sure it’s all laying nicely and there are no gaps. 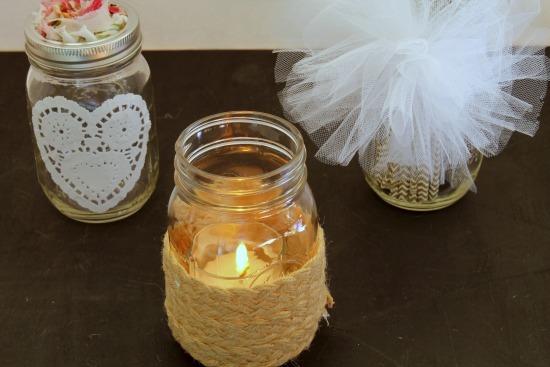 You can use these decorated Mason jars to decorate around your home or even for cute storage ideas. Have fun! 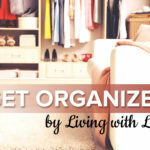 You have posted some great ideas here. We go through pickle jars regularly. I feel bad for throwing them away, but now I have some idea as to what do with them. They will even work great as gifts.